New Delhi: Buoyed by the successful auction of his monogrammed suit, Prime Minister Narendra Modi today said that he would sell off all his clothes to boost country’s ailing economy. 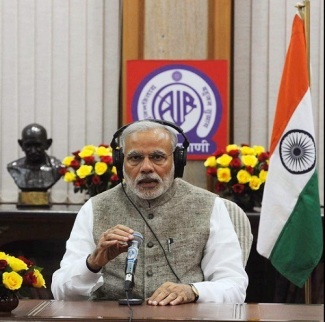 Describing the auction of his histroic suit – with pinstripes spelling out Modi’s full name – as a historic moment for India, Modi revealed his upcoming plan in an address to nation on radio programme Mann Ki Baat aired by All India Radio before the commencemnt of the Budget session. Modi’s monogrammed suit fetched a whopping Rs 4.31 crore during an auction at Ahmedabad in Gujarat. The special episode of Mann Ki Batt was also broadcast live by NDTV 24×7, Times Now, Aaj Tak, CNN-IBN and other news channels. Foreign television news channels CNN, Fox News, DW, BBC and Aljazeera also stopped their routine telecast to air Modi’s histroic address. Modi said that the days of poverty for Indians were over, and the growth rate would henceforth be determined by his wardrobe. The prime minister asserted that no worn out mufflers would be able to stall the new wave of growth in the country. He also hinted at a policy of judicious use of new found wealth. “Like Gulf countries regulate their oil production, I will also be judiciously regulating my wardrobe production,” he said. As Modi was addressing the nation, his newly created Niti Aayog, the erstwhile Planning Commission announced that the prime minister has donated three kurta pyjamas for setting up a 10,000 MW nuclear power plant in Rajasthan, two pairs of undergarments from his childhood days for child literacy programs, and a tea pan from his tea selling days for alleviating poverty of the downtrodden.